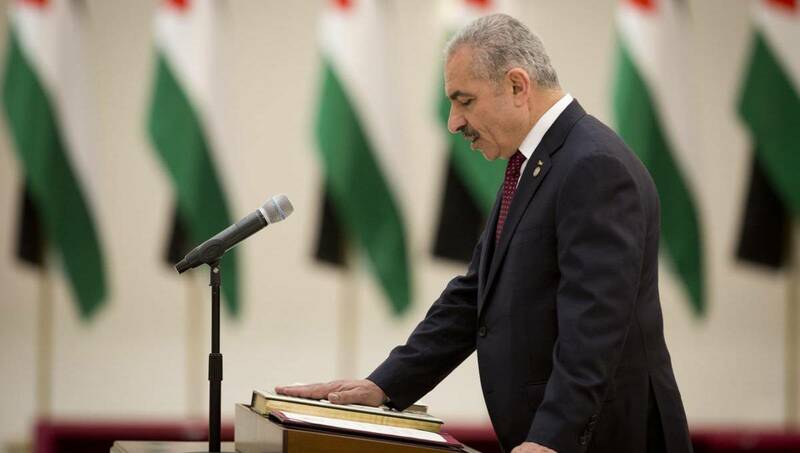 Photo: Palestinian Prime Minister Mohammad Ishtayeh talks during a swearing in of the new government in the West Bank city of Ramallah, Saturday, April 13, 2019. Ramallah, Apr 14 : A new government for the West Bank-based Palestinian Authority was sworn in Saturday, led by a veteran peace negotiator and harsh critic of Gaza’s Hamas rulers. President Mahmoud Abbas picked Mohammed Ishtayeh as prime minister, a move that deepens the internal Palestinian divide at a time when prospects for a peace deal with Israel are possibly at their lowest point ever. A longtime adviser to Abbas and a senior member of his Fatah party, Ishtayeh and his 24-member cabinet took the oath of office at Abbas’ headquarters in Ramallah. Ishtayeh faces tremendous challenges, with the PA in a deep financial crisis following U.S. sanctions and Israel’s withholding of $138 million in key tax revenues it collects on behalf of the Palestinians. Israel says the slashed sums were designated for families of Palestinian who carried out attacks against Israel. The new cabinet replaces a technocratic government formed by Rami Hamdallah in 2014 after an agreement between Fatah and Hamas, the Islamic militant group that has run the Gaza Strip after ousting Fatah and evicting the PA in 2007. Despite enormous Egyptian efforts, the attempted unity government failed to reconcile the two groups. Abbas’ firing of Hamdallah and assigning Ishtayeh, a British-educated economist, to lead the next government reflects his frustration over the narrowing chances of an inter-Palestinian unity accord. As peace talks with Israel ran aground years ago and the Trump administration will likely put forward a peace plan that the Palestinians say favors Israel, Abbas badly needed to garner power at home and extend his control back to Gaza, which Hamas governs separately. But Hamas accused Abbas of acting unilaterally, saying in a statement Saturday that swearing in a “separatist” government “boosts the division between Gaza and the West Bank as a practical step to implement the ‘deal of the century,'” the name the Palestinians use to refer to the undisclosed U.S. peace plan. In a meeting with the new cabinet, Abbas, 83, called on them to continue “to fight the (Israeli) occupation with all legal means,” referring to U.N. organizations, as well as through “peaceful popular resistance.” He said Israel should bear the “consequences” if it did not withdraw from territories it occupied since the 1967 Mideast war. Last year, the Trump administration recognized Jerusalem as Israel’s capital, triggering the Palestinian Authority to sever its ties with Washington. The Palestinian leadership fears that Israel would retain major Jewish settlements in the West Bank and that the seat of the future Palestinian state would be in Gaza instead. Ishtayeh’s government, which controls those parts of the West Bank on which the PA has autonomy, doesn’t feature significant changes from its predecessor. Five members, including those of foreign affairs, finance and the two premier deputies, retained their posts. Ishtayeh holds the interior and religious portfolios. The Palestinian government runs day-to-day affairs while Abbas and the PLO’s Central Committee, which he also heads, manage the political decision-making. Ishtayeh, 61, holds a PhD in economic from University of Sussex and had been a minister in previous governments. He was also a member of the Palestinian negotiating team.